Are you ready for A breathtaking 10 day journey through the most spectacular landscapes of Ireland’s wild Atlantic coastline & Ancient East? Our magical 10 day tour of Ireland may be just what you’re looking for! Jump aboard for the adventure of a lifetime as we explore the ecological wonders of the Emerald Isle and learn about Ireland’s fascinating history. We will take you off the beaten track to experience magical landscapes, spectacular adventure experiences, meet the vibrant people of Ireland and unearthing our unique Gaelic culture. Truly the best of Ireland! 2. 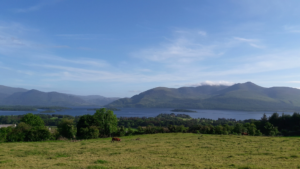 Check out this view in the wonderful town of Killarney. Must be experienced! 3. Visit one of the best beaches in Ireland at Inch in Dingle. 4. 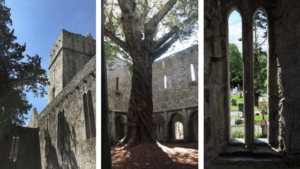 Marvel at the spectacular Muckross Abbey as we guide you through the history of this special landmark. 5. The Cliffs of Moher! One of Ireland’s most visited attractions and a must do. 6.Take the opportunity to soak in Galway’s vibrant bustling streets and quaint cafes. 7. Visit the Island of Inis Mor, in one of Ireland’s Irish speaking regions. A cultural hotspot! 8. Walk through Connemara National Park, one of Ireland’s six national parks and take it all in. 9. 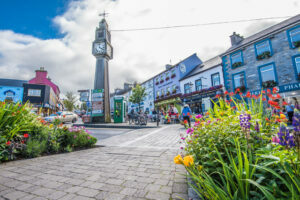 Explore the picturesque town of Westport in the west of Ireland, one of our favorites. 10. Journey to one of Ireland’s most unique and special locations, Newgrange. A 5000 year old Passage Tomb. “There were plenty of magnificent photo opportunities and the guides allowed us to stop as often as possible – despite Ireland’s weather. The days themselves were well paced and definitely not rushed. We never felt like we were on a time limit which is often the case with many tour companies. The accommodation was B&B and we were all very well looked after. Not a bad word to say. I would highly encourage anyone to look through their tours.